After several high-profile incidents, governments around the world have become alarmed at the collateral damage that has been caused by the Avengers operating with no apparent oversight. Members of the United Nations have drafted the Sokovia Accords and are demanding the Avengers agree to the Accords or be disbanded. Steve Rogers (Chris Evans) is concerned that motivations of the UN can change on a whim. The Avengers may either be limited from helping situations that need to be addressed by the team called into action when it may not be the course of time. Tony Stark (Robert Downey, Jr.), on the other hand, wracked with guilt, agrees that the team must be held accountable for their actions. The rest of the team is divided on the issue. When Bucky (Sebastian Stan) becomes the subject of a manhunt, Captain America and those supporting him find themselves at odds with Stark and his followers. Loyalties are tested and lines are blurred. Friends find themselves battling over what is right. But what is right may not be as clear as it seems. If this sounds familiar, that’s because this year’s other superhero blockbuster, Batman v. Superman, uses almost this exact story. Both use the civilian damage caused by superheroes as the underlying reason for the conflict. While I think it is important the this be addressed, both films seem to drop this story once we get to the action. At that point, the collateral damage continues and even escalates. This may be labelled as a Captain America film, but it feels more like another Avengers film. Almost all the new Avengers team shows up in this character stand alone. Black Widow (Scarlett Johansson), Scarlet Witch (Elizabeth Olsen), War Machine (Don Cheadle), Falcon (Anthony Mackie), Vision (Paul Bettany), Bucky Barnes (Sebastian Stan) all must choose a side. Only Thor and the Hulk are noticeably missing. We also see newcomers Black Panther (Chadwick Boseman) and Spiderman (Tom Holland) added to the mix. Where Civil War bests Batman v. Superman is introducing characters we know. Instead of rehashing a backstory everyone knows and we’ve seen many times, Peter Parker just dismisses the question with, “It’s a long story.” This is how it should be handled. There is too much going on to care about an origin story that everyone knows. Even with Black Panther, we are given just a glimpse of where he came from. Enough that we can understand and appreciate the character without trying to delve into the nitty gritty. Another major difference is that we’ve been watching these characters for the past 8 years. We know who they are, their relationships, how they work together, and their conflicts. This makes the stakes all that more important. It also makes it harder to choose a side. As I mentioned, the story dumps the heart of the divide once the action starts, focusing more on the relationship between Cap and Bucky. This is a Captain America film, after all. The beginning moves a little too slowly for my taste. It takes too long to get to the meat of the action. (This helps to account for the hefty 2 1/2 hour run time.) Once we get to the action, though, it is worth it. 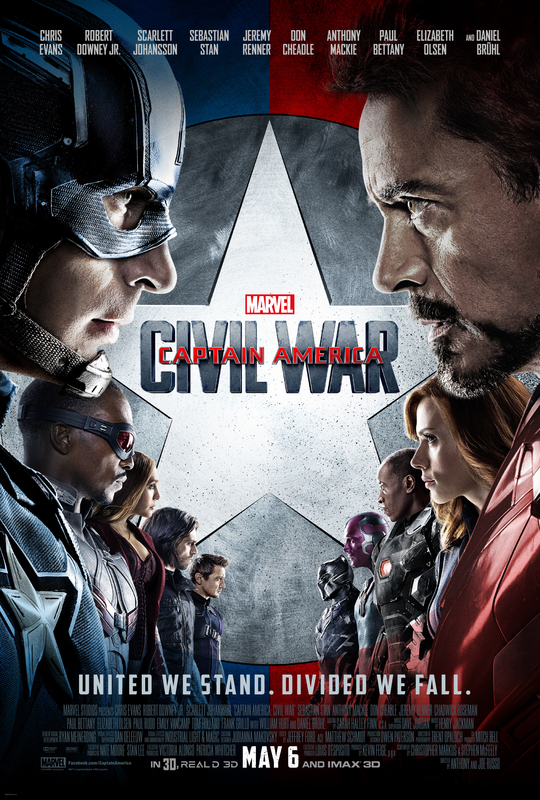 Civil War is the best Captain America film of the bunch, though, part of this may be due to the full cast of Avengers. This film will definitely shape the future of the Marvel universe. It will be interesting to see the dynamics of the team in the next Avengers movie. It is definitely a must-see. I just wished they would have been a little more aggressive with the editing and got it closer to the 2 hour mark. Also, make sure you stick around for both end credits scenes.